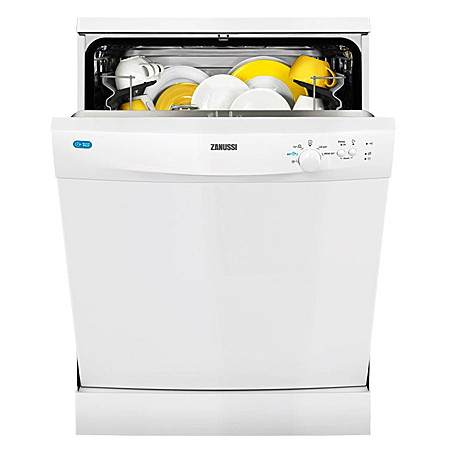 The Zanussi ZDF21001WA dishwasher is rated A+ for energy efficiency and has 13 place settings. Stylish and modern, this dishwashers flexible baskets offer lots of capacity and flexibility to suit all types of loads. You can easily fit in up to 13 place settings and get all your crockery and cutlery sparkling clean. This dishwashers 70°C Intensive Care program gets even the dirtiest pots and pans ultra-clean. The increased temperature of the last rinse maximises the hygiene of your kitchenware, ensuring 99.99% bacteria-free results. The Set & Go feature makes it possible for your dishwasher to start automatically at exactly the time you want - even when youre not around! Pay an initial 10% Deposit of £41.00. A £29 settlement fee is payable at the time of final payment. Settle the balance in 12 months interest free.